Youth mentoring programs are continuously looking to improve the services they offer and the outcomes they produce, but it can be hard to know where to begin with program improvement efforts. 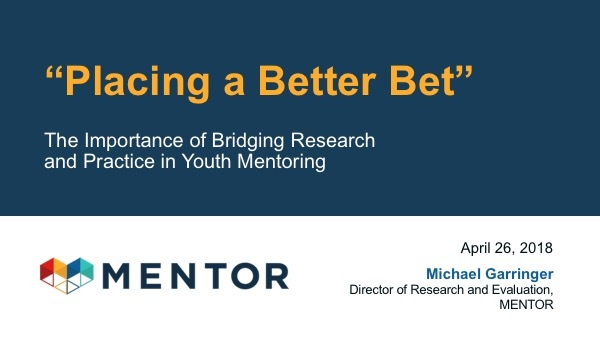 And while most mentoring programs strive to be “evidence-based,” it is often unclear what that means, let alone how to go about collecting data that proves it. This webinar is intended to help mentoring program staff think about the wide world of research that can help inform and improve their work. Topics covered include a) Why and how research can improve a program’s outcomes, b) Strategies for measuring the right things in any program, c) Applying research in mentoring and other disciplines to your own program, and d) Sources of translational research.